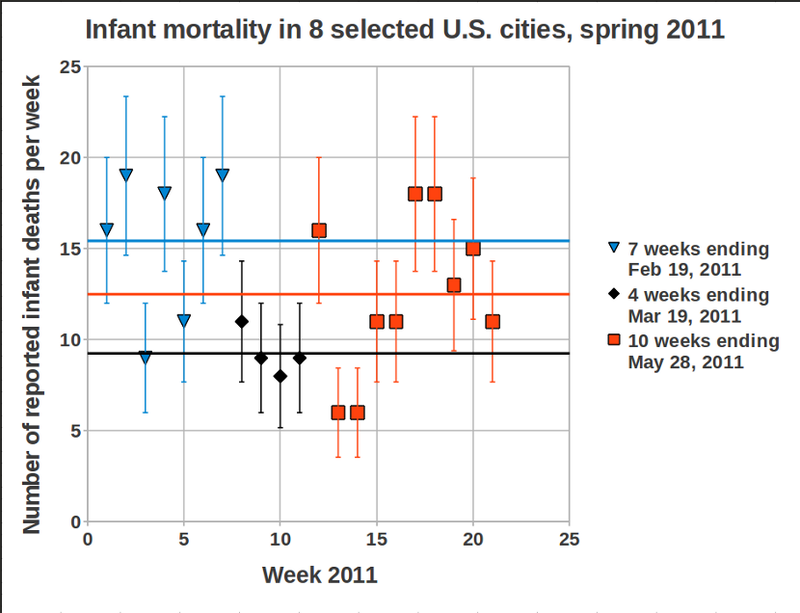 Cliff Mass Weather and Climate Blog: Fukushima Radiation and Infant Mortality in the NW? No way. 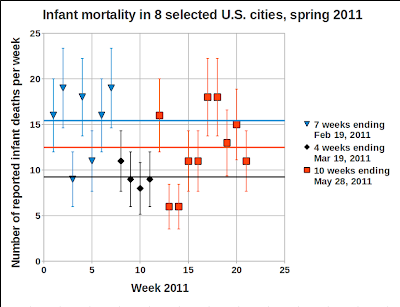 Fukushima Radiation and Infant Mortality in the NW? No way. Irresponsible environmental scarsters are back. During the past few days a number of you have emailed me about several media stories and web reports about radiation from the Fukushima nuclear plant causing a 35% increase in infant mortality here in the Pacific Northwest. The majority of the mainstream media did not go with this story, but a few did, like our local KCPQ (see story here) and other outlets like examiner.com and the well-known Aljazeera. This was all based on a report by Physician Janette Sherman, and epidemiologist Joseph Mangano that was published online by the "Progressive Radio Network" and by the web site "Counterpunch." 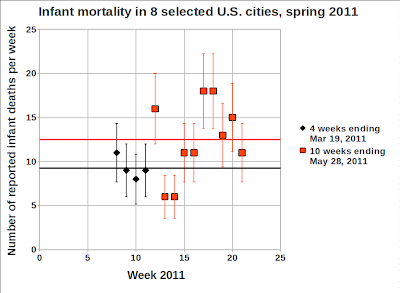 In this report they noted that for the 4 weeks ending March 19, 2011 there were 37 deaths (avg. 9.25 per week) but for the 10 weeks ending May 28, 2011 there were 125 deaths (avg.12.50 per week). They note that "this amounts to an increase of 35 per cent (the total for the entire U.S. rose about 2.3 per cent ) and is statistically significant." Folks, this is complete and utter nonsense and shows the downside of the web---crazy stuff gets sent around and news-hungry and sloppy media pick it up and give it credibility. First, the whole premise is silly. That the extraordinarily small amounts of radiation reaching our shores from Fukushima are killing infants through some mysterious mechanism. But it is worst than that...just plain bad statistics! The average of the four weeks before (black line) is below that of the 10 weeks after (orange line). This is what Sherman and Mangano were basing their radioactive scare on. But what if we go back further in time to the beginning of the year (see below). The story changes completely! There is a lot of variability in infant mortality and the period well BEFORE the radioactivity reached us had as high or higher mortality rates as the last few months. Bottom line: those authors "cherry picked" the data to allow them to conclude what they wanted. There are stronger words for such "research" but since this is a family-oriented blog I won't be any more explicit. So what you're saying is that low infant mortality rates cause nuclear disasters? I saw this information earlier this week and remembered your post about the weather patterns/ radiation levels after the event and quickly dismissed it. Cliff, it makes no sense on a biological level either. Fetuses in the first trimester are most susceptible. These infants would likely have been in the last trimester of residence in the womb. It is during the first trimester that most cell types are differentiating, and thus the susceptibility is if one of those cells is damaged due to an external event, there is a greater likelihood the defect from cell division of the damaged cell will exist in the newborn, and will exist in a far greater number of cells. Conversely if the damage occurs in the third trimester or after birth, there will be fewer cell divisions of the cell, and thus less expressed damage. Ideally to test whether there was an effect, one would examine at least a year of prior data to look for the variability and compare the data swing observed to that. But even that would be inconclusive as there are no dose-response relationships to show that in areas where higher doses were received, the mortality was higher. Thanks Dr. Mass! I was so worried. You should consider writing your own comic strip as part of your science outreach efforts. Thank you, thank you for covering this! It's infuriating that some in the media will repeat whatever drivel sounds exciting, and depressing that so many people fall for it. It's super nice to see a scientist like you making all the same points that I did. Looks to me like yet another example of waaaaay too many people in the U.S. of A. having far too little education, understanding and knowledge about science, statistics and critical thinking. As always, Cliff thanks so much for clarity and firmness. I'm glad that there are responsible scientists around who will point out errors like this. I think we need to consider an addition to mandatory high school curriculum that will teach kids how to be more savvy about information and statistics they see online. We expect kids to use computers for everything, but we provide them with very little formal instruction on how to tell a good Web source from a bad one. The "hive mind" is a wonderful thing...but there are some cases where misinformation is more than just an irritation. Sometimes it can be downright dangerous. 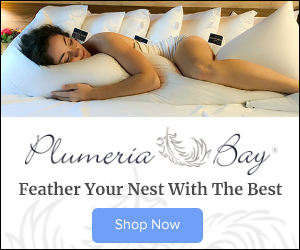 I am disappointed that you have spent a blog discounting a rather ridiculous fall out scenario rather than providing the sort of weather information I have come to expect from your blog. I am concerned about having a nuke melt down upwind of my family and I would have much preferred info on the location of the jet stream and the amount of radiation measured at the monitoring sites in the PNW or any other relevant information that doesn't get covered in the mainstream media. I don't want to be reassured or frightened; simply better informed. Oh this makes my head hurt. Even with my limited knowledge of the effects of radiation I know that the tiny amount of radiation that may be drifting over from Fukishima would only effect us over a long period of time with continuous exposure. And even at the levels we're exposed to the reality of that right now is slim. And I only have the most basic scientific education. It worries me the overall lack of education in this country. It never ceases to amaze me when I see doctors publish studies asserting some sort of statistical significance in their results. The big issue here is the sampling size is much too small to be of any real significance. Certainly, you can get by with small sample sizes for legitimate studies, but that assumes you have good random populations of data where other factors are controlled-- obviously this is not the case here. It is probably best for doctors to let professional statisticians analyze the data. Thank you for the high dose of sanity and clarity. Much appreciated. I'd place the blame slightly differently, on the scientists that should be shouting this down en masse as Cliff did in his blog. Let's face it, most of the public cannot assess statistical significance and interpretation of time series, and rely on scientists for the right answer. 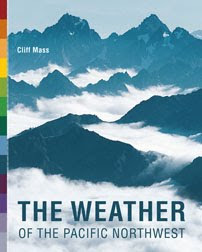 News media should rely on scientists of proven reliability, and withdraw wrong reports, rather than play up nonsense. Too bad for nuclear energy that the public is very bad at evaluating very small risks. Although it is also too bad for engineers that they assigned a small risk to the Japanese reactors. Oops, that was mainly us seismologists who didn't include M9 earthquakes in our forecast for that region! In high school, good math students usually get calculus in their senior year. Incidents like this make me think a year of statistics would be more useful. Students who end up in science or engineering will need both. But just to understand the news, even non-scientists should have some statistics. The comment that the mainstream media did not pick up on this story is meaningless because the mainstream media have not been covering Fukushima at all. The only recent sources of information have come from abroad. So, it is easy to see how conspiracy theories of all kinds could get started. The Japanese are doing the world a disservice by their lack of transparency. The complete lack of transparency on the part of Tepco and the Japanese government is responsible for the creation of conspiracy theories. However, to say that the mainstream media did not pick up this story because it has no merit is false. The mainstream is not covering Fukushima - and anyone following this disaster closely knows that. Almost all information after March has come from foreign news sources. Cliff, thanks for stepping up to the plate on this infant birth thing. Do you know that Arnie Gunderson claim that people in Tokyo and Seattle have found contaminated car air filters that have caught "hot particles"?? Nobody else is presenting evidence of this. Cliff this is great. Do you know about Arnie Gundersen's claim that radioactive car air filters have been identified in Tokyo and Seattle? He seems to be the only source of this data. The province of British Columbia today announced that infant mortality for the first six months of 2011 exceeded the infant mortality for all of 2010. Officials attribute the infant mortality spike to "poor parent training." In the CBC story on the announcement, no mention was made of Fukushima. Do you have time to do an update on this post? 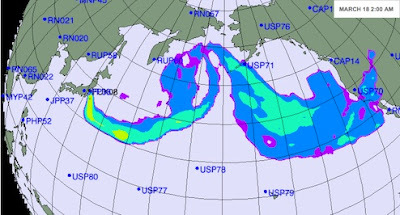 Was there any longer-term effect of the Fukushima Radiation? Do we have any more data? There is a wonderful out of print book "The Biomedical Bestiary" that explains in simple terms, many of the most common statistical errors made even by serious researchers. Among them are items like the example in this blog. Many of the others like "measurable, but not meaningful" where something indeed causes a doubling of the incidence, but the incidence is 1 in 2,000,000 so for all practical purposes is 1 in 1,000,000 any different? Or applying a population-based measure to an individual (BMI is the perfect example - I would have to lose 100% of my body fat and 10Lbs of lean muscle mass just to make the top end of normal). These same errors can be applied to weather statistics as well as medical statistics, so I don't find this off base at all.